The ideal romantic getaway, Oakdene Vineyards Guesthouse is located on the Bellarine Peninsula near Ocean Grove & Geelong, on 230 acres of lush coastal farmland at the Oakdene Vineyards property. The original 1920's homestead has been beautifully restored & boasts three uniquely themed accommodation rooms situated above the restaurant Marty @ Oakdene. at the onsite cafe Mr Grubb @ Oakdene. In-room local 'Wildings' mini hamper selection and coffee & tea facilities are also provided. Perfect for star gazing, the Attic Room offers high ceilings, spacious surrounds and a smaller en-suite bathroom. With high windows overlooking the Oakdene gardens you will be sure to have a most relaxing an memorable escape. The Marilyn Room features an in-room, all glass en-suite for a romantic and intimate getaway. With countryside views of the vineyards and gardens, a stay in Marilyn's Room is a relaxing and unforgettable experience. The Water Room is perfect for a weekend escape. 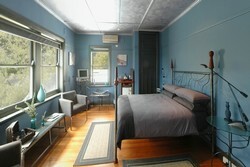 Overlooking the garden and vineyards, this room has been well designed offering space, natural light and soothing decor. With a corregated iron water tank that has been transformed into an amazing en suite, this is yet another unique feature of Oakdene that will ensure a most enjoyable experience.